This was inspired by Steph Stone's mani -- which she used the NCLA nail wraps "Aly En Vogue" that she designed. Aren't they beautiful!? I love the design so much, I decided to free-hand them~ I have on 2 coats of China Glaze's Mimosa's Before Mani's and 2 coats of Orly's Pure Porcelain over the florals. The studs are from this stud box. 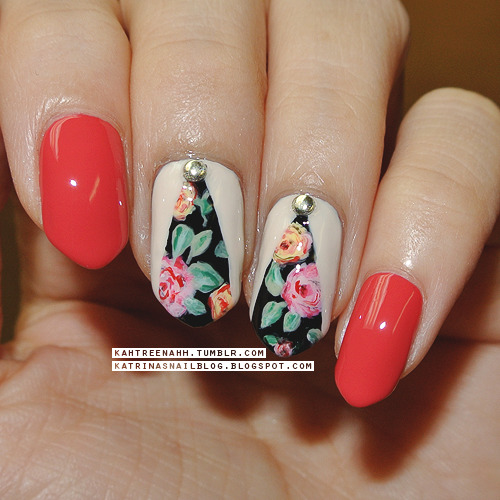 These nails are so gorgeous! I wish I could free hand like that! This is amazing and such a different idea - great job! I can't believe you free-handed that. You're way talented, and I love it in a V shape! These are so beautiful, I love how you've done them! So cute, nice work! You should post your nail art on Bellashoot :-) It's a﻿ social beauty network dedicated to beauty and I'm sure users there would love to get beauty tips﻿ from you!! Beautiful floral pattern! Your freehand skills are amazing! Love love love this! The roses are amazing!